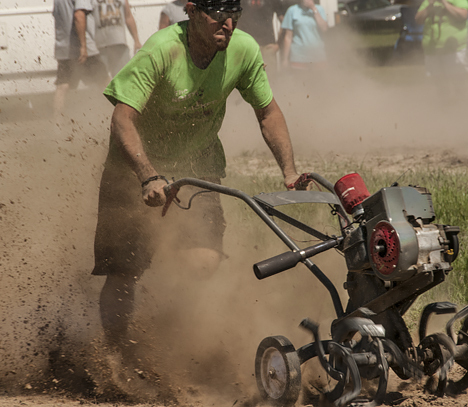 When a tiller race starts and the souped-up tiller first bites Mother Earth the dust flies, part of the appeal and excitement of rotary tiller racing at the World Championship Rotary Tiller Race during the world-famous Purple Hull Pea Festival at Emerson, Arkansas. The announcer sits calmly as the racer’s heartbeat jumps exponentially. If you are searching for a unique experience in the company of new-found friends, put the last weekend of any June, at Emerson, Arkansas on your calendar. It’s not necessary to dress up, come comfortably to the Purple Hull Pea Festival at Emerson. You’ll rub elbows with nice folks there. Click on the tiller racer for more Emerson pix and info. You will also have the opportunity to consume the properly prepared namesake legume, watch a parade, be entertained, observe the World Pea Shelling competition, dance in the streets, see a fireworks spectacular, and observe The World Championship Rotary Tiller Race.There’s nary another place on the planet that can deliver on that. You also now have the opportunity to see more pictures and information on the festival on the Photo of the Week page at Corndancer dot-come where this tale of fun got underway in the first place. 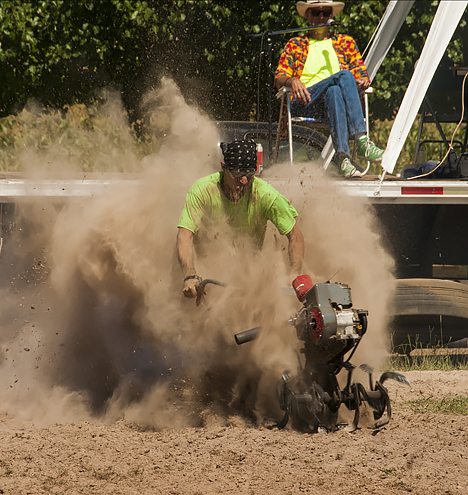 Rotary tiller racing at the Purple Hull Pea Festival is not limited to good ol’ boys. 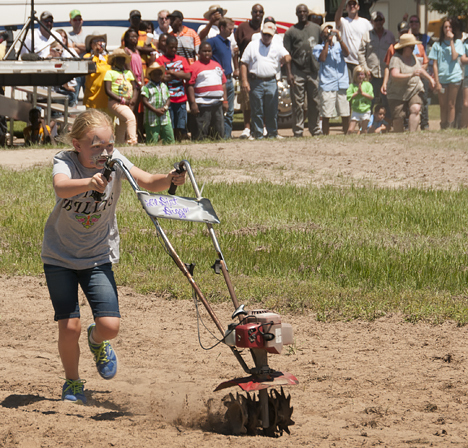 Little girls (and little boys), and their mothers, sisters, and aunts race tillers as well. It’s a family thing. Before the big race starts, you can watch the world renowned “Million Tiller” parade as part of the festival. You will see a great collection of antique tractors, local beauties, four wheelers, horseback riders, motorcycles of all stripes, families being families and civic and church groups showing support for the big event. Be forewarned, sometimes the tiller count is a tad shy of a million. The family that parades together stays together. 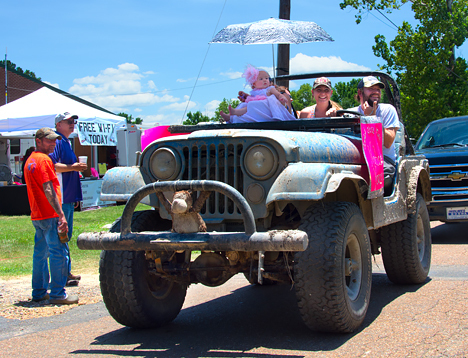 It’s not every day you see a family in a jeep adorned with a teddy bear, (at least that’s what I think it is), a proper crusting of mud, all smiles, and a beautiful baby daughter under a parasol (OK, umbrella) — in a parade. It is just too cool, and you saw it here first. Among the star attractions of the parade this year, in my humble opinion, was a “motor-trike” powered by a Chevy engine, the back end of which is a replica of the classic slick back Corvette Stingray. As I was salivating while shooting this magnificent beast, the driver told me to be sure and shoot the back. He was on the move so I had to whirl fast to do his bidding. 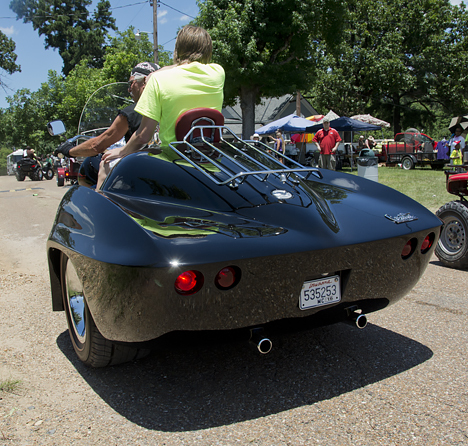 As promised, the aft end of the trike is a true Corvette Stingray replica. The lacquer is so shiny it picks up a reflection of gravel in the street. 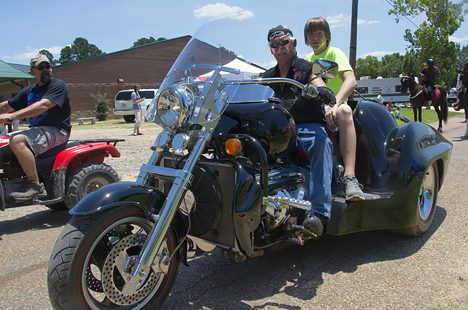 The Purple Hull Pea Festival in Emerson, Arkansas, population 368 (or there about) is small town America at its best. You go. You enjoy. You leave. And you are glad you went. In LA (lower Arkansas), that’s a “it don’t git much better than that” experience. See 16 tiller race pictures in this gallery. See 30 parade pictures in this gallery. 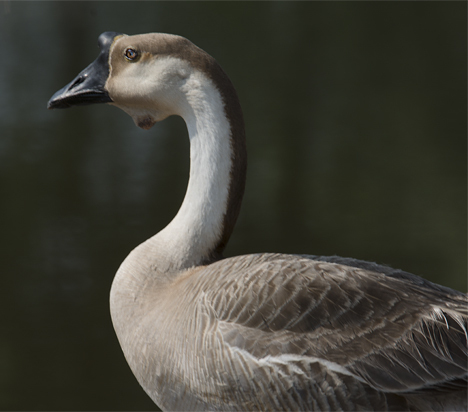 This is a Chinese Swan Goose, part of a pair that call the fishing pond at Martin Luther King Park home. 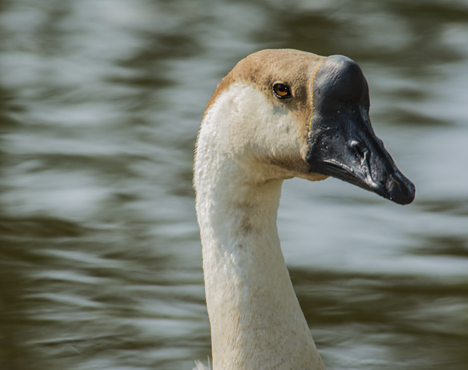 They are a heckuva lot bigger than most geese, but smaller than a swan. From what I could see, they also have an attitude and the rest of the pond gives them a respectable berth. I had occasion to recently visit a local park here in Pine Bluff, Arkansas, my home town, to photograph some senior citizens from Davis Life Care Center on a fishing trip. I work at Davis, so it was a labor of love to photograph the proceedings. It had been a few moons since I last visited the park and I had forgotten that waterfowl call the park fishing pond home. Click on the osprey for six more osprey pictures. Speaking of finding birds, a few weeks ago, during the Felsenthal Bream Fest, I found some other birds. Ospreys. In the wild. In range of my optics. I photographed same and this week these magnificent raptors are featured on the Photo of the Week page at Corndancer dot-com where you can see five osprey pictures. May I inquire as to who you are and why you are here? Thank you, this is my best side. Will you post it on Facebook? Thank goodness, I just had my feathers done this morning. Meanwhile, back to the fishing exercise. This is cane pole territory as well as dragonfly territory. 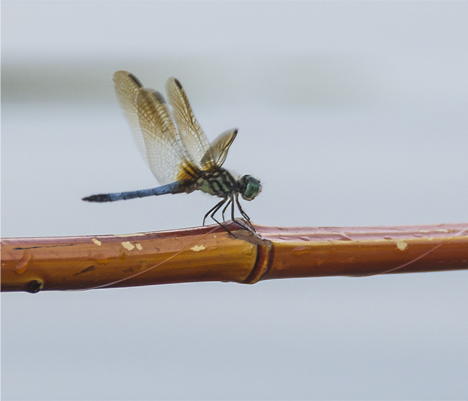 As one of the anglers dangled her bait in the pond, a dragonfly decided the fishing pole was a perfect perch. No southern pond bank fishing trip is complete without a dragonfly landing on your pole. This one showed up right on schedule. Here in LA, we have a lot of hardwood trees, which translates to a lot of squirrels. Due to the cuteness factor of these little tree rodents, they are fat and happy during fair weather when the park has a lot of visitors. 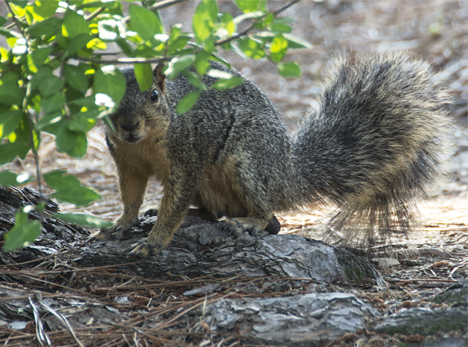 They twitch around, flick their tails, give you an innocent look, and out come the pistachios, Cheetos, peanuts and other miscellaneous snacks. The little boogers have us well trained. This squirrel had just retreated to consume a pistachio and was carefully watching for the next manifestation of human largess. 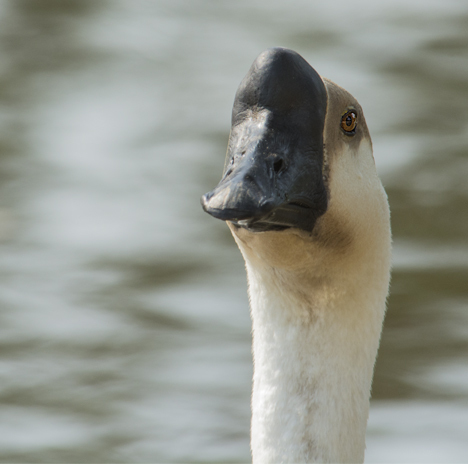 I went back to the park the next day to see if my geese would sit for more pictures. The fickle beasts had repaired to an inconvenient area of the pond and would not budge. Fortunately, a small dog decided the fill in for the geese. 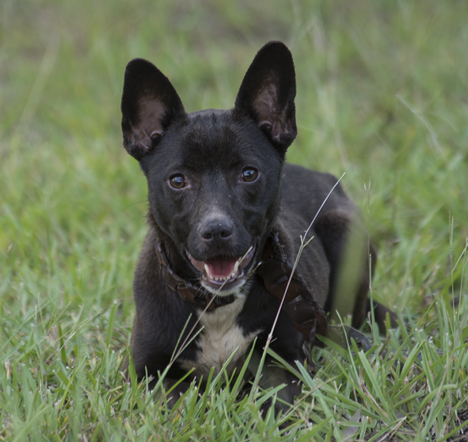 This small dog on the outskirts of the park was my goose stand-in the second day. The city animal control department AKA “pound” is adjacent to the park premises and I’m thinking this little one may have made good his or her temporary escape. Sixty or seventy miles to the south, I ran across a small herd of cows late in the afternoon as I was traveling to photograph the Felsenthal Breamfest. Most southern cows in small pastures relate a pickup truck to supper time, so when you stop to shoot, you always have an attentive audience. This time was no different. These cows see my truck and think “supper.” I hated to disappoint them, but it did make a good shot. Notice the strand of “bob-wahr” in the foreground. This week look close by, you may see something cool. I hope so. 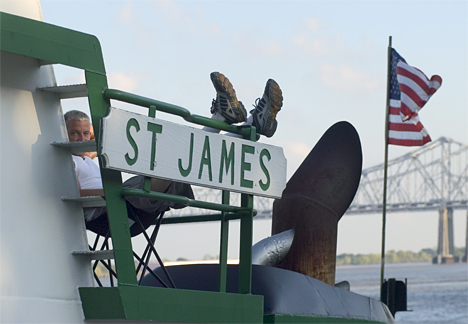 This tow boat crew member is showing his cool in the face of loud music and a big crowd at the 2002 French Quarter Fest in New Orleans at Woldenberg Park. The mighty Mississippi is in the background. We caught each other’s eye as I shot and he seemed to think it was OK. We were both good with the world as we knew it at the time. And lo, it was cool. Click on Stella the lab and see more pictures. This week, we are celebrating the 300th Cordancer dot-com Photo of the Week, the sister site of Weekly Grist for the Eyes and Mind, a new indoor record for this ol’ boy. The Corndancer page came first and stirred my little pea brain to start Weekly Grist. At Corndancer this week, we have posted four pictures, two never-before-posted and a couple of favorites. I am grateful to my long-term friend and co-conspirator Ebenezer Baldwin Bowles, the chief cook and bottle washer at Corndancer dot-com for his stellar work and hatching up the idea of the Photo of the week. Most people who go to his site will tell you it’s not a stretch to graze through the many and varied pages for hours. Take a look at the Photo of the Week page. This week. following our idea at Corndancer, we are posting some old favorites here at Weekly Grist as well, the next of which is a nicely placed rainbow. I was alerted to this rainbow by a friend. Fortunately I was on the move when I got the call. 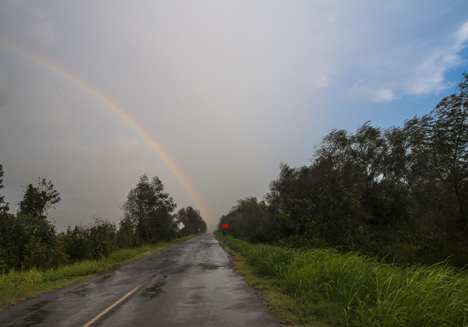 But, by the time I arrived on the scene and jumped out of my truck to shoot, the rainbow was fading fast in the face of a rapidly moving thunderstorm. I managed to get one five shot burst before I had to jump back in the truck. It is always better to be lucky than good. 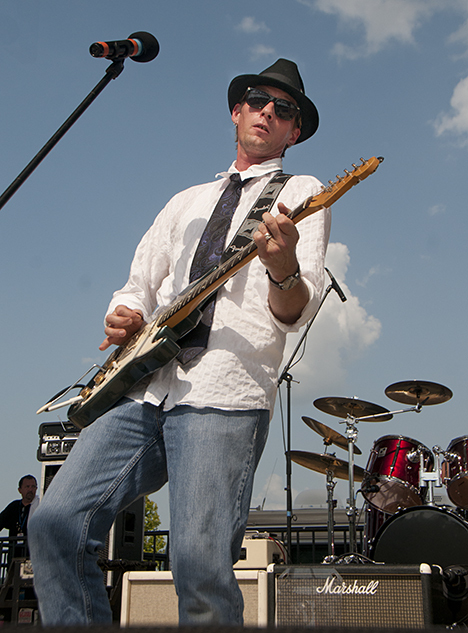 Bluesman Brian Austin belts it out during the 2012 “Red, White and Blues” concert sponsored by “Blues for a Cause,” here in Pine Bluff, Arkansas. The organization is presenting a similar event at which Austin will perform again, July 4, 2013 at the Riverside Amphitheater in the Pine Bluff/Jefferson County Regional Park. And last but not least, more prima-facie evidence that the weather around here is as crazy as a tree full of owls, a picture of our horizontal snowstorm. At Davis Life Care Center, we call this area, “the park.” Just after Christmas of 2012, a snowstorm blew in so hard, most of its deposits were on vertical surfaces. This is the morning after. Snow on the tree trunks and precious little on Mother Earth. By the way, this is the 235th Weekly Grist for the Eyes and Mind. Lord willin’ and the creek don’t rise, we will continue to send these dispatches. We always welcome suggestions for subject matter. Have a goodun. At the risk using trite, hackneyed, verbiage — “this is what it is all about” — introducing the next generation of anglers to the sport. It’s not a stretch to believe this is a father-son combo. 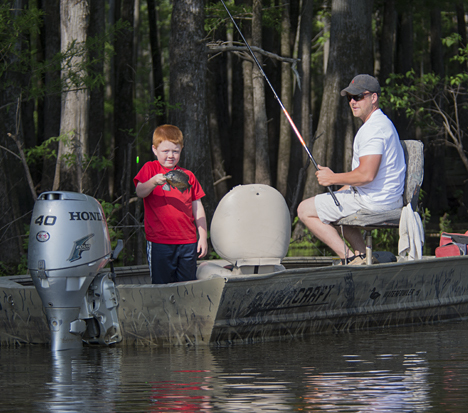 They are catching bream and making memories at the 2013 Felsenthal Bream Fest tournament. The iconic pastime in LA which overshadows most others is fishing. While many practitioners of the sport of Isaac Walton in these parts are dually addicted to “havin’ a garden,” it is the former rather than the latter that garners our attention today — in the town of Felsenthal, Arkansas. The whole family participates in the Bream Fest bream tournament. We featured another view of this intrepid group on the Photo of the Week Page at Corndancer dot-com. Click on this picture to see the other one. The remoteness of Felsenthal is its appeal. 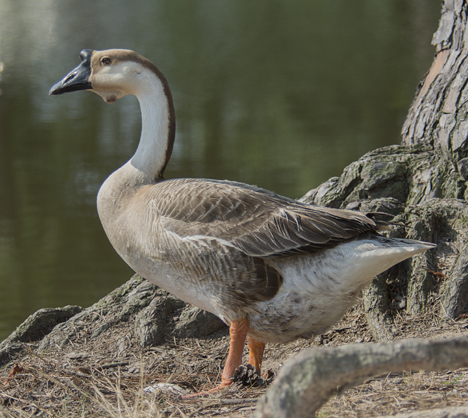 The town sits on Grand Marias lake next door to the Felsenthal National Wildlife Reserve which sits on top the Upper Ouachita National Wildlife preserve in north Louisiana. You have to be going there to get there, it is not a place you pass through on the way to somewhere else. It is a destination. Speaking of destinations, be sure and check out the Photo of the Week page at Corndancer dot-com where this story started. See more pix, get more info. On Memorial Day the town’s population rises exponentially as folks flock in for the Felsenthal Bream Fest. The event includes a pageant, inflatables, bands and a street dance, a pageant and last but certainly not least, a bream tournament. 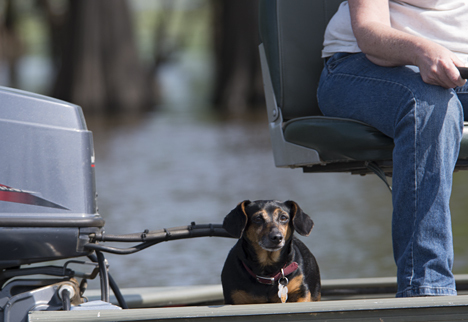 Not all participants paid fees to fish. 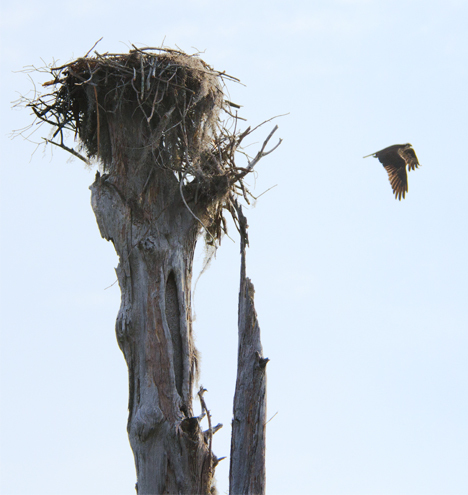 This angler, an osprey, spooked off its nest, safely ensconced atop a tall deceased cypress, before I spotted it. 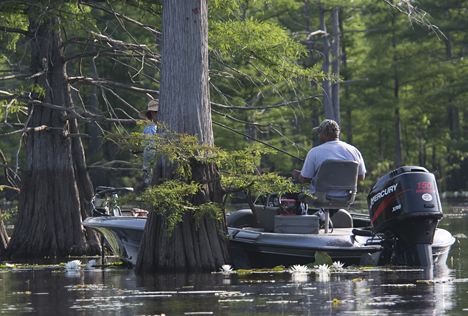 This is the quintessential “spring-fishing-in-the-cypress” scene. The image speaks for itself and tells a nice story. 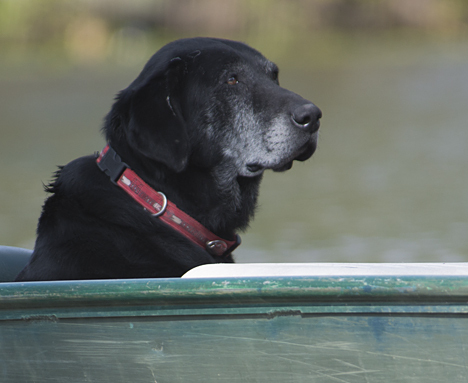 This old Lab seems content with his human companion. I’m thinking this pooch would have been put out if not included in the trip. This dog saw the camera and went ears up. Perhaps he or she has had media training. In any case being included is his or her deal. Intrepid anglers head out on the lake in all directions to drag in their catches and later gather at the weigh-in site to see who takes home the prizes. In the meantime, a bunch of fun is had. Mission accomplished. It’s not often you see the bell-shaped base of cypress trees. 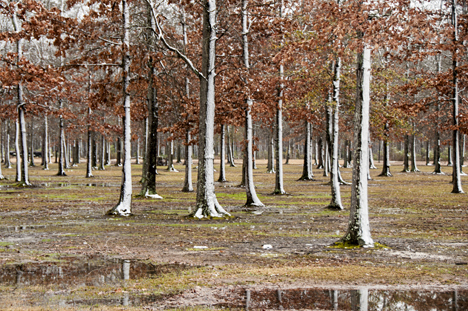 Drying conditions in 2009 created the opportunity to see just that at Enterprise Lake in Wilmot, Arkansas. Click on the picture for the original 2009 story and pictures. Here in LA, 2009 was as “dry as a powder house.” Nowhere was that more evident than at Enterprise Lake in Wilmot, Arkansas. The lake is populated with hundreds of old-growth cypress trees which normally tower out of the waters of the old ox-bow lake. Not so in 2009 for many of these magnificent giants. See more pictures in our original post and see our original story on the Photo of the Week page at Corndancer dot-com. Receding waters left the trees closer to the shoreline poking out of dry land which was formerly inundated lake bed. The situation was not good for the trees which thrive in water. On the other hand, it was a good set of circumstances for an interloping photographer and writer. I had the privilege of walking among the giants without getting my feet wet, an opportunity afforded to few. Click on the trees for our original Corndancer Photo of the Week story. It was a humbling experience to stroll amongst these unique creations of our God. I heard a symphony of breeze wafting through green boughs dangling animated tendrils of Spanish Moss. I saw shafts of sunlight streaking earthward through the natural skyscrapers. The trees cast the same spell as a waterfall. I did not want to leave. When I finally – and reluctantly departed, the birds giggled. As well they should.